Introduction to Human Services 3 Edition Provides readers with an understanding of the Human Services Profession. 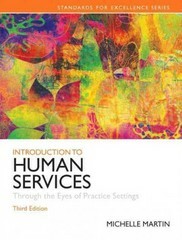 Introduction to Human Services: Through the Eyes of Practice Settings, 3/e explores human services through the lens of the most common practice settings where human service professionals work. This title also provides information about social problems within a socio-political context allowing readers to think about ways in which culture and ideology influence people’s perspectives. Standards for Excellence series -- Each chapter highlights the national standards set by the Council for Standards in Human Service Education (CSHSE). Critical thinking questions throughout reinforces this integration. Learning Goals Upon completing this book, readers will be able to: Understand the issues pertinent to human services from new perspectives. Challenge the status quo of human services. Recognize their own stereotypical thinking that may create barriers to becoming effective helpers.